Finding a Mitsubishi EVO X running 19×10.5 CE28Ns is damn near impossible. 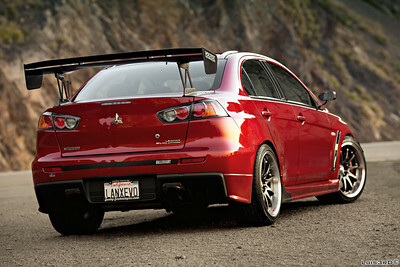 I happen to stumble on this car while doing a feature of his friend Luis and his 08 Subaru Impreza WRX STi. 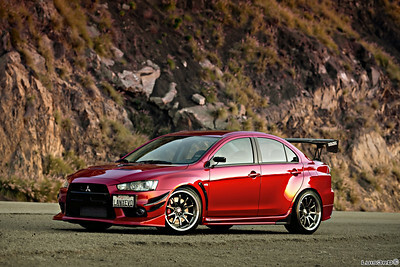 Archie has chosen to build his Mitsubishi EVO X for Track use. I look forward to seeing some results from Archie once he hits the track. Archie has been in the Mitsubishi Lancer EVO world for awhile now, this being his second EVO. 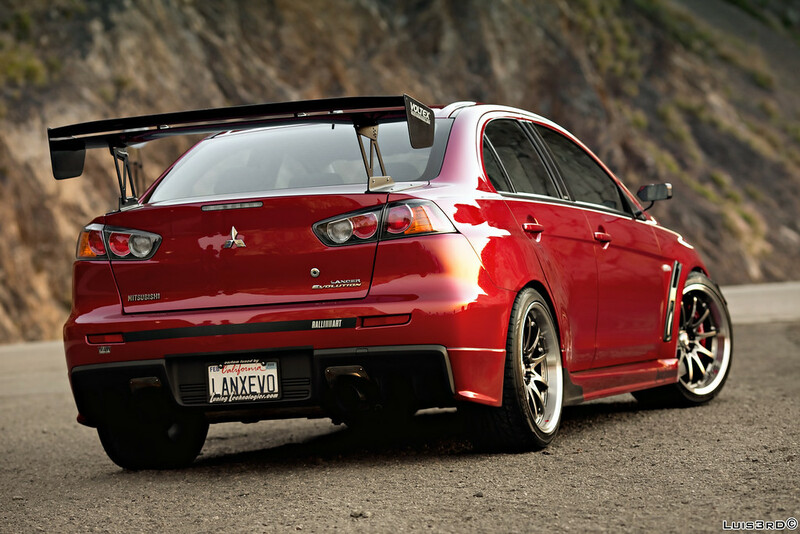 The first Mitsubishi Lancer Evolution Archie had was a 2003 EVO VIII. The EVO X is a perfect example of the word Evolution. 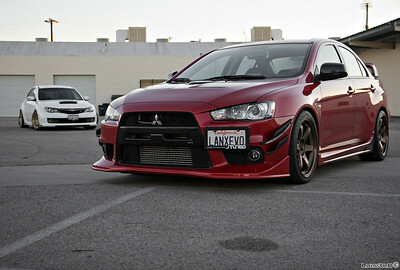 The EVO X you see here has one hell of a mod list. 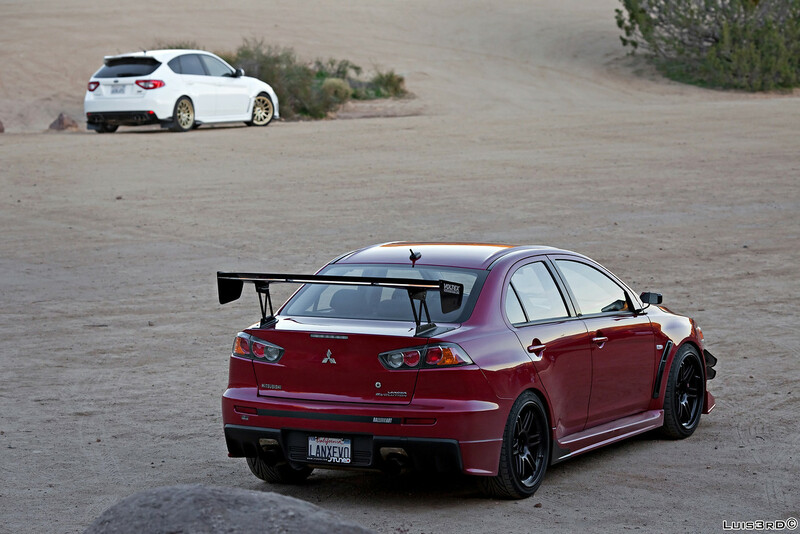 The brands of choice trickle their way down the JDM alphabet from the likes of Bride, Defi, HKS, JUN, Ralliart, Varis, and Volk. Archie hasn’t focused on only JDM parts, the Ultimate Racing exhaust and AEM alcohol injection are two of the key components netting his strong power numbers. Archie’s Mitsubishi EVO X hit 358whp and 366wtq on pump 91 and 100% Meth with 26.5 psi of boost. To re-cap; No slouch in Performance, No slouch in Wheel/Tire Fitment and No slouch at the track. 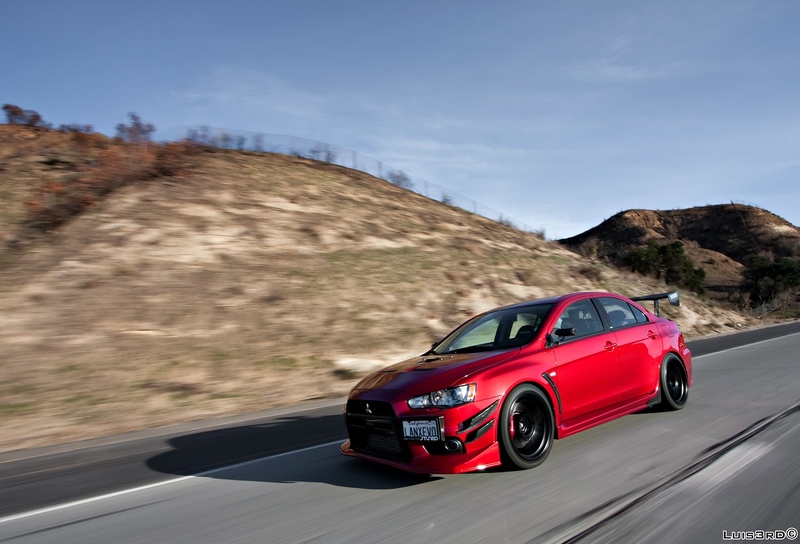 This EVO X is no slouch at all. I can’t wait to see what else Archie has in store. Archie has had a few different wheels on his EVO X. 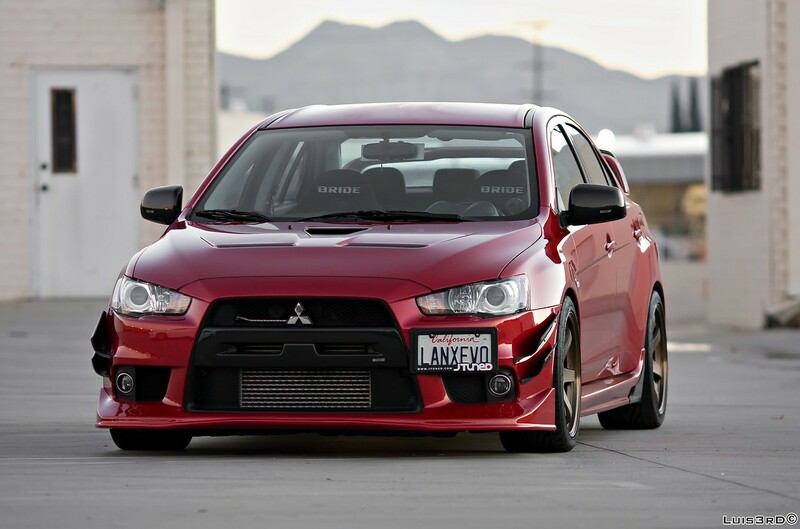 All three listed here look great on the EVO X, none of which are the same color or design truly showing off the EVO X’s great lines and aggressive stance. Going into the wheels in a little more detail is needed. (Really just and excuse to post more photos). 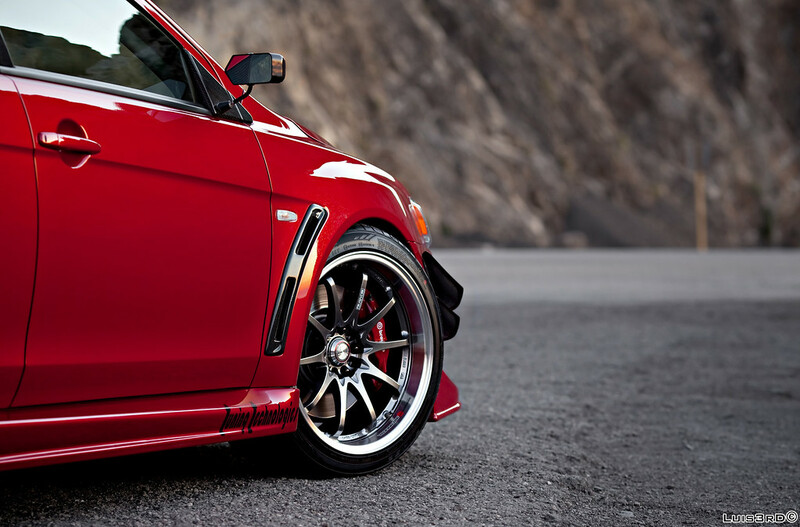 The 19×10.5 CE28Ns weren’t exactly a simple bolt on fitment. Archie had to roll the rear fenders and remove the front fender liners to make these wheels and 275/35/19 tires fit. Another requirement of getting the wheels to fit was the addition of some camber in the front, currently Archie is running -2.5 front camber. 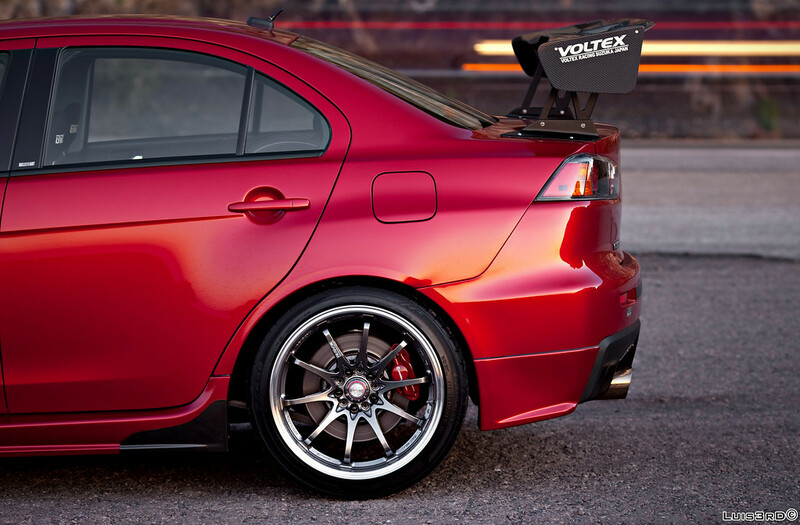 Archie first had the 18×9.5 +22mm Volk Racing TE37s wrapped with 275/35/18 Toyo T1Rs, the 18×9.5 +22mm TE37 has that highly desirable concave face that is becoming ever so popular. The concave face doesn’t happen on 18×9.5 TE37s until the +22mm offset, the popularity of this wheel and the ease of fitment lead Archie and his EVO X to a new set of wheels quicker than he expected. Archie wants to thank wife Marigil for supporting him throughout his mod addiction. There isn’t much more to say but enjoy the excellent photos taken by Luis. 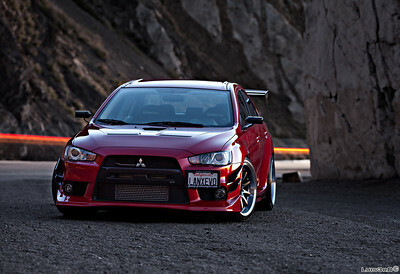 More of Luis’s photos can be seen here (2008 STi 18×9.5 +40mm SSR Type-Fs) and here (http://luisbicol.smugmug.com/cars). As always any questions or comments don’t hesitate to email or comment. 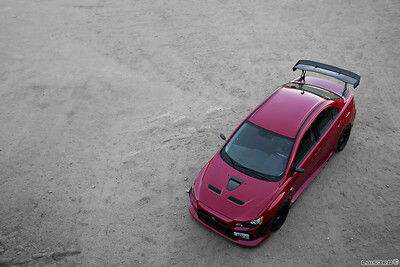 In the coming weeks there will be more articles focusing on the EVO models, any recommendations of features or ideas feel free to Email me. 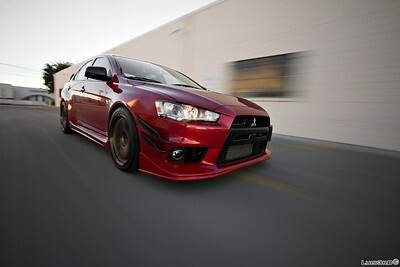 On to the pics from Luis!